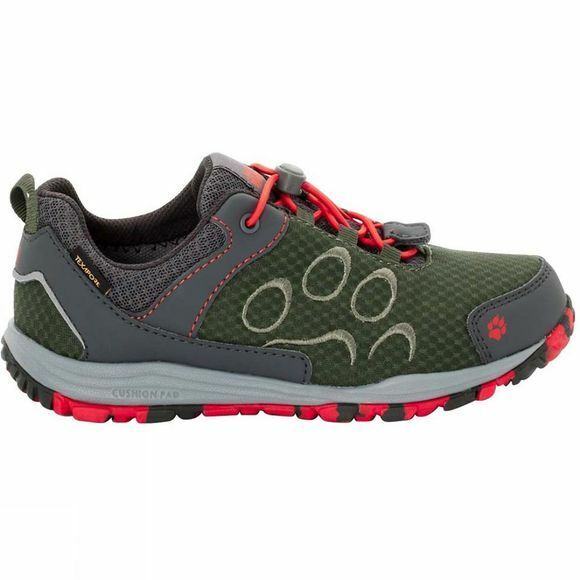 Checking out the sights, hanging out down by the lake, or a school trip to the amusement park–the Kids Portland Texapore Low Shoe from Jack Wolfskin is a multi-purpose travel and leisure shoe for kids that turns every day into an adventure. It is waterproof and lets feet breathe. In town or at the playground, all day and every day, the airy mesh upper, breathable lining and advanced cushioning make this lightweight shoe amazingly comfortable to wear. The shoe features an elasticated speed lacing system for lightning-fast fit adjustment. And if they decide to give the subway a miss and walk home because it's such a beautiful evening, the sole cushions every step.